Wow, and like that the first month of 2013 is almost over. I kind of feel like I didn't get much out of January since I spent most of the month taking care of a sick kiddo or being sick myself. It also didn't help that I had a hard time trying to get myself out of holiday mode and back into a routine for the first 2 weeks of the year. No wonder if felt like January flew by! Because I felt like I slacked off all month, I'll definitely be super busy in February. I'm hoping by the end of February I'll have established a good routine that will result in me being able to get a lot accomplished. Such as sewing up project bags for the shop, finishing at least one knit, and finally blocking the ones that were done eons ago. Oh, and the chance to actually sleep every few days! Maybe it's because one of my goals this year is to knit up as much of my bulky weight yarn stash as possible or the fact that it's been pretty nippy out, whatever it is all I've been able to think about these past few weeks is casting on for a quick and cozy cardigan. And a pair of these cottage slipper socks. I hate wearing slippers and socks around the house (or in general...I'm a total bare feet or flip flops kind of girl...which is weird considering how much I love hand knit socks), but lately it's just been way too cold out to not wear anything on the ice blocks otherwise known as my feet. I have no idea if I'll even get around to knitting up a bulky weight, comfy cardi or even those socks anytime soon since I'm still not allowing myself to cast on anything new until I finish a few WIPs. Let me tell you, it's been torture! But I think when I do get to finally cast on, the new project will have to be quick and quite the instant gratification knit. And we all know that means something knit in bulky weight yarn! Since the beginning of the month I've been going through my stash over and over (and over) trying to figure out which skeins can leave the nest. I seem to always go on a destashing spree about this time of year, maybe it's the motto of "new year, new start" that gets to me but whatever it is I just get this urge to destash a little bit of yarn. I might not have mentioned it at all on the blog, have probably only mentioned it a few times on Instagram, and probably only a handful of tweets on Twitter, but destash mode has definitely been going on around here. I'm quite determined to get the stash under control and to actually knit with stash this year. How serious am I? Enough that I made myself a full on spreadsheet of my entire stash (which can get alarming when you discover just how much yarn you really have) and will be meticulously plugging in every single skein that goes into the stash, that leaves the stash, and that gets knit up. So how am I doing so far? Well, considering this is just the first month of the year, I'm going to have to say not too shabby. I've knit only a little over 1100 yards, brought in almost 3000 yards (I'll be honest here, these skeins were yarn from a sock club, yarns that I won, and yarns given to me to knit samples from), and destashed well over 4000 yards. According to the spreadsheet, a measly 2500 yards has actually left the stash. Hey, don't start the "tsk, tsk'ing" on me just yet. Like I said, it's only January! PS: The yarns in the photo above are NOT up on the chopping block. It's meant to be just eye candy for blogging purposes!! 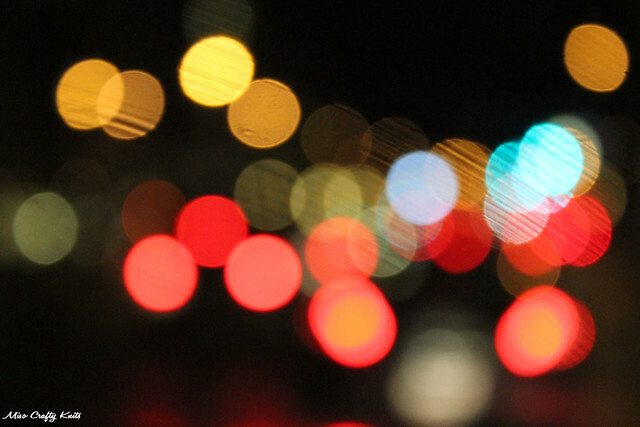 Bokeh is a Japanese term that means "blur" or "haze" and in photography Bokeh is the eye-pleasing out of focus effect caused by simply blurring areas of a photo. The current most popular form of Bokeh are the filters of blurry and colourful dots, hearts, and many other shapes that you can get in photo editing apps on smartphones and tablets. I'm not only obsessed with these apps (I have several on my phone, I should really weed some of them out! ), which you can't really tell since I never post them on Instagram, but I'm also obsessed with trying to create this effect with my own camera as well as in Photoshop. I really wish I had the moola to get the right lens to create bokeh properly but for now I'm content with my phone apps and traffic lights. My friend Landon introduced me to this British series back in 2007. We stayed up for 2 nights in a row to watch the entire first (and at the time, only) season. I was hooked after watching only 10 minutes of the first episode and since then have kept up religiously with the series. When I found out that the series wasn't going to be renewed after the 6th season (which aired last year), my heart nearly stopped. I was so sad. Why must all the good shows be cut so short? At the time people kept trying to tell me not to worry because an American version was being filmed. Meh. I haven't seen it and I'll admit, I have no interest. I can tell you already that the original British version is probably a million times better. And I think I'm right, since the American version was cancelled after only 1 season. For those of you who don't know anything about Skins, it's a British teen drama series (don't let the teen part put you off, cause it's honestly juicy!) that follows that lives of a group of teens living in Bristol, England. From that description you're probably thinking "wow, that sounds boring...how much teen drama can one person handle?". Well, let me tell you, this series likes to keep things interesting by changing the main cast completely every 2 years. So in the 6 seasons that the show aired 3 different "generations" have been featured, with each episode highlighting a character. I'm not going to go into detail about the story lines and characters, you'll just have to watch it and see for yourself. But the one thing I can say is: be careful, it's a highly addicting show! These teens sure do make my early twenties seem like a day at kindergarten! Anyhoo, a few weeks ago I discovered that Netflix has seasons 1-5. So you bet I've been staying up late a lot this month trying to get my Skins fix! As if that wasn't enough excitement, I found a few weeks ago that there will be a mini season 7 that will feature one cast member from each generation! Oh my glob! Can I be any more excited than I already am??? Eeek!! January is usually the month in which I try to save as many pennies as possible and try to be a little on the frugal side. Mainly because this is when I truly realize just how much money I've spent during the holidays and when I try to plan for the new year. Tell me I'm not the only one that does such a thing? So in sad attempts at saving money this is the month in which I try to cut back on, well...pretty much everything. Buying yarn, eating out (not that I do much of that anyways), frivolous grocery purchases...you get the picture. But this year I realized that I was already scaling back quite a bit anyways from previous months. My only splurges were the coffees/tea lattes that I was purchasing at knit nights and throughout the week (and no, I do not have a $6 a day coffee habit!). My solution to combat my excessive-for-the-moment caffeine habit? Bring my own from home! Or simply avoid any and all coffee houses. Coffee was the easy one for me to do (read: my trusty mason jar, Cuppow and cozy combo) but what about the days when I'm feeling the tea? I'm a fan of loose leaf teas but there was no way I was going to be toting around my pincer or my tea strainer! 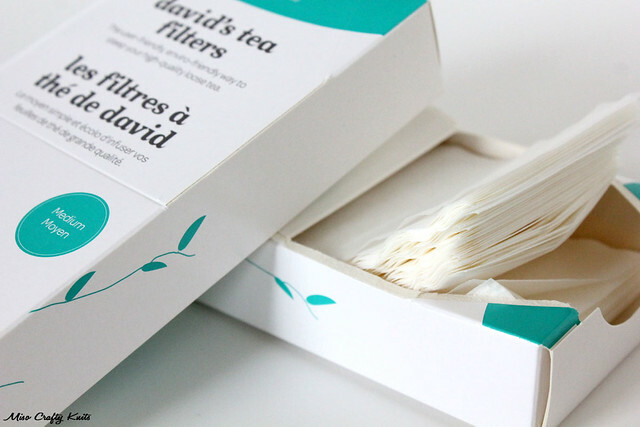 Luckily I had caught the David's Tea Boxing Day sale and managed to snagged 2 boxes of biodegradable filters for half the price. I've never purchased filters before and now that I have them and use them, I'm wondering why I've never done it before! They truly are a lifesaver for the busy bee on the go - or for when you're feeling über lazy and don't want to clean your metal strainer. I've taken to filling up a few bags with my favourite teas and carrying them around in my handbag in case the need for a hot bevvy when out and about arises. Now, does that make me a cheap skate? Meh. I don't care. I think I'm being crafty and it's saving me a few bucks while I'm at it. So it's all good in my books! Well, that's it for January. There's not much for knitting on this list but when I was at my sickest I really didn't have the energy to knit. You know you're sick when... Like I said at the beginning of this post, hopefully February will be a more productive, sick-free month in which I get my groove back. Or at least something that resembles a groove. I'd be willing to settle for that. As long as I can sew more than just 3 measly project bags (like I did this month...so pathetic! ), I'll call it a success. So, what were you all about this month? Do tell! 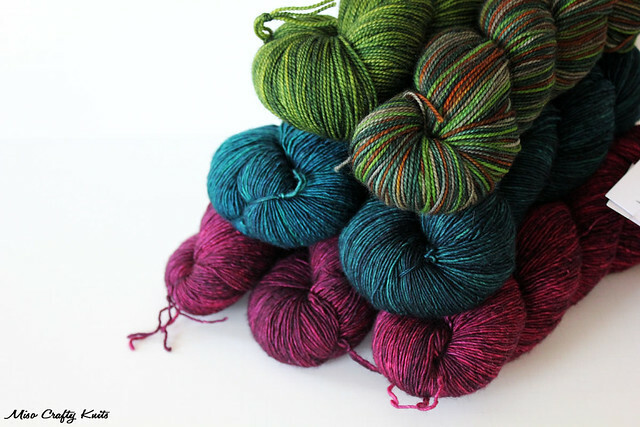 Okay, you have got to have the best yarn photos in the blogsphere. They make me want to taste the yarn, for real! I totally sympathize with your destashing obsession, only mine relates to fabric. My yarn stash is limited to two very small Tupperware containers. My fabric stash, on the other hand, amounts to almost 200 metres. Crazy! Let this be the year of de-stashing! Aw, thank Andrea! :) Holy smokes, 200 meters of fabric?? I can't believe you had brought that all the way out West with you! Although I love seeing what you've whipped up next! Let this definitely be the year of destashing! I had read when you posted before about David's Tea (with your beautiful pictures)and I never could forget about it. I have a serious tea addiction. So tonight I finally ordered some tea from them. I'm super excited. It looks so good. Thanks so much for sharing about them.